6th of December marked four years since the murder of 15 year old Alexis and the uprising of December 2008. On the day protests against police violence took place aross Greece. Remember, remember the 6th of December. 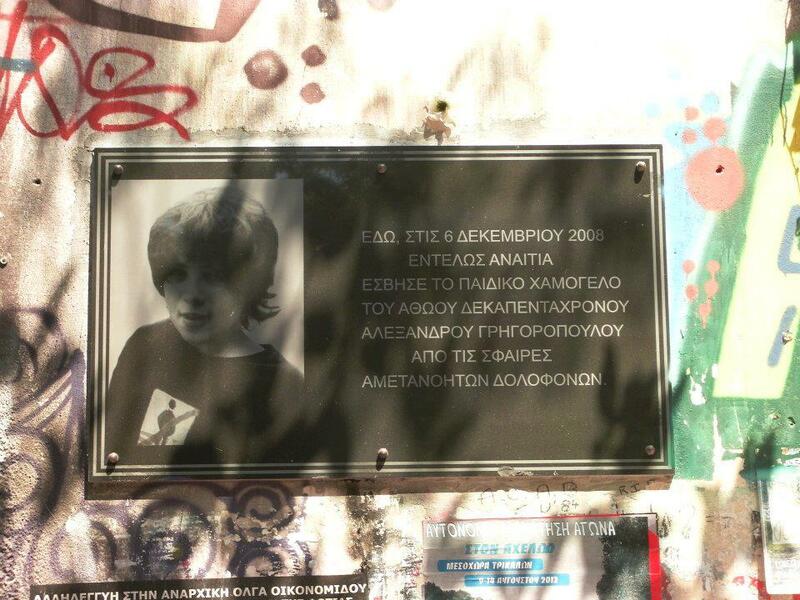 Four years on the police murder of 15 year-old Alexis Girgoropoulos was remembered on the streets of Greece. Almost every major city or town across Greece held a demonstration against police and state violence on the 6th December. Some of the demonstrations led to clashes with police forces and arrests. The cold blooded murder of Alexis on 6th December 2008 sparked weeks of protests, riots and attacks on police stations across Greece. This December uprising and Alexis have been remembered every year since. The centre of Athens saw two demonstrations. In the afternoon a large number of students, many the same age as Alexis was when he was murdered, held a demonstration. Later in the evening another demonstration took place. Long into the night there were heavy clashes with the police in the central Athenian neighbourhood of Exarcheia along the same streets in which Alexis was murdered. Barricades were put up and people defended themselves with stones and molotovs as police attempted to storm the neighbourhood(video). During the street fights there were reports of severe injuries and dozens of detentions. At least 12 people, including three minors, later faced a prosecutor. Elsewhere in Greece similar protests and actions took place. The second city of Greece Thessaloniki as well as smaller cities like Larissa, Lamia, Volos, Rethymo and Kavala all saw protests. People in Agrinio, western Greece, clashed with police during a march through the city centre. In southern Greece supporters of the fascist Golden Dawn attempted to block a march through the town of Kalamata. There were also events outside of Greece which commemorated Alexis. The murder of Alexis and December 2008 are not yet a piece of history. Coming as they did at the start of the current financial crisis they still form part of the present in which we live. People in Greece are currently living through times of increasing repression and police violence. The murder of Alexis is a tragic example of the very real possibility that anyone could be a victim of police violence. So the 6th of December is not simply a matter of commemoration it's a continuation. Neither the violence of the murder nor the power of the uprising in response have been forgotten. As the posters for the demonstrations state a ghost hangs above the city. This ghost is the memory of December and it haunts those who would rule Greece.